This weeks parable is about the lost son. 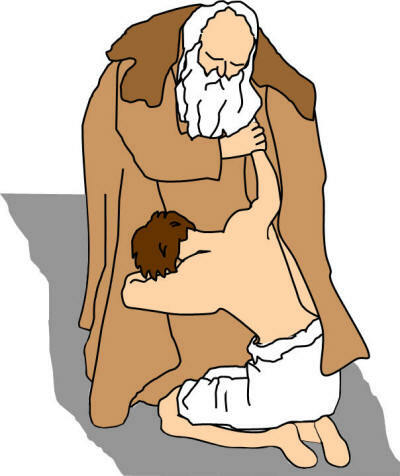 This story is also called the prodigal son. Prodigal means to spend a lot of money on things you don't need and being very wasteful with what you have. You will see that, that is exactly what this son does. This is the parable that Jesus told: There once was a father that had two sons. One day the younger son said to his father, "Father, could you give me my inheritance?" (Inheritance is money the father would give his children after he had died.) So the father thought about it and decided his sons could have the money now, and he split it evenly between them. Very soon after the younger son received the money, he decided that since he had so much money he would move to a different country and have some fun with it. When he left, he left for good. He took every last thing he had and didn't plan on returning. He wanted to be grown up and spend all his money how he wanted with no one to tell him what to do. So he just left. He left a big farm with many hired men with everything he needed, he left his family, and more importantly he left his father who trusted him enough to give him the money. This probably made his father very sad and I'm sure he missed him very much. While the son was gone he spent all the money he had right away. He didn't think to save any of it. He ate out every meal every day, he bought fancy cars, he threw wild parties and spent money on many other things that God wouldn't be happy with. After he had spent all his money, the country he was living in became very poor and they hardly had enough food for everyone. It was even worse for people who had no money because food became even more expensive, so it was very hard for poor people to get any food. The son was in trouble. He had no money, no place to live, he had nothing to eat, so he had to get a job. The only job he could find was feeding pigs. He was so hungry he tried to eat the food that the pigs were eating but his boss caught him and told him if he ever saw him doing that again he would lose his job. That night as the son was walking home his stomach wouldn't stop growling, he was so hungry. He saw some people walking towards him and he asked them if they could give him any money for food, but no one would give him anything. Everyone was so poor it was hard to share with anyone. The son went to bed hungry and when he woke up he realized something. When he lived with his father even the hired men had more food than they needed, and now he was starving to death. At that moment he made a plan. He would go back to his father's house and say to him, 'I have sinned against God and against you. I don't deserve to be called your son, so hire me and I will work for you." He knew that if he became like a hired man on his father's farm he would still be better off than he was right now. He would always have a warm place to stay and food to eat. So he headed for home. It took the son a long time to get home, he was just hoping that his dad would let him work at the farm and let him be a hired man. The son was walking up the to farm but while he was still a long way off and he could see someone notice him and start to run towards him. He was sure that they must have been expecting someone else, no one would be excited to see him. As the person got closer he realized it was his father and he was yelling, "My son! My son! You are finally home!" He couldn't believe it. His father threw his arms around him and kissed him. But the son quickly said, "Father, I have sinned against God and against you. I don't deserve to be called your son..." The son wanted to continue but the father said to one of his servants, "Quick! Bring the best robe and put it on him. Put a ring on his finger and sandals on his feet. Bring the biggest calf and kill it. Let's have a party and celebrate because my son was lost and is found!" A little while later, the older son was working in the field and heard music and dancing. So he called to one of the servants and asked what was going on. "Your brother has come home and your father is having a party for his return." This upset the older brother and he refused to go join the party. The father heard that he was upset, so he went to talk to him and invited him to join the party. But the son refused saying, "Look! I have been working for you all these years and I've never disobeyed you. Yet you never had a big party for me to celebrate with my friends. But now my younger brother has come home, spent all the money you gave him, and you kill the biggest calf for him!" "But, my son," the father said, "you are always with me, and everything I have is yours. We had to celebrate and be glad because this brother of yours was lost and now he is found." In this parable the father in the story is just like God. This is how God would be if we ran away from him and we started doing things we shouldn't. He doesn't give up on us when we do things that are wrong, and he will always forgive us if we've truly changed and repent for what we've done. Now the older brother in this story just shows how most of us would act if this happened to us. I think we would all be upset if our younger brother or sister ran away for a long time and did a whole bunch of bad things and then came home and your parents threw a big party for him. The father who had been wronged, was forgiving. But the eldest son, who had not been wronged, was unforgiving. In this parable Jesus gives a clear picture of God and what God is like. God is truly kinder than us.